As I mentioned previously, one of my daughter's former allergists had talked about a "newer, better" peanut allergy test coming out. 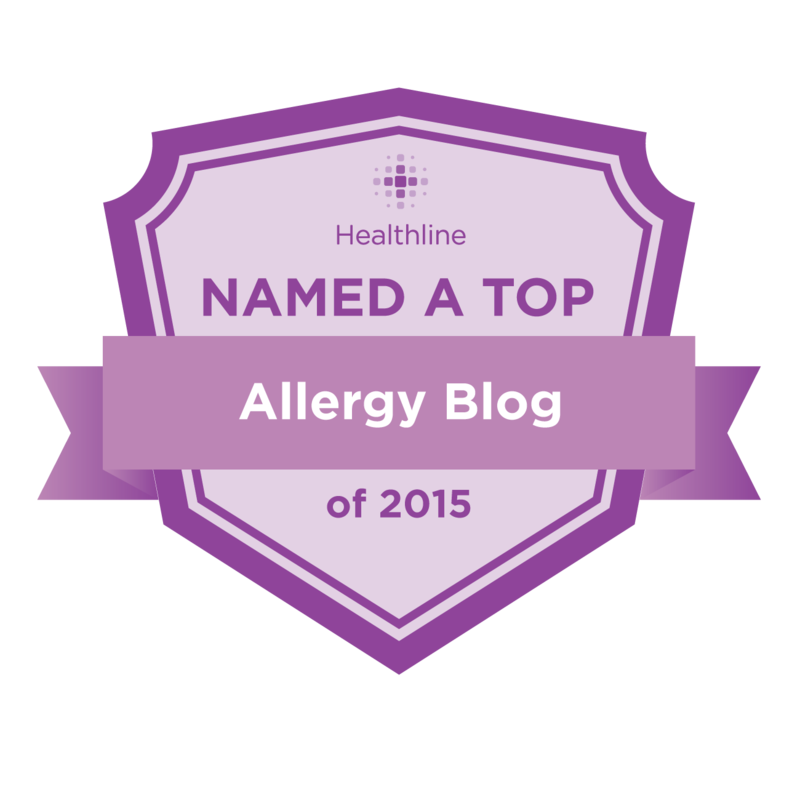 Then, I came across this post on One Spot Allergy's blog, which discussed peanut component testing. You can read all about it, there, but the gist of it is, they have figured out which particular proteins are most linked to systemic (i.e. anaphylactic) reactions and which ones tend to cause milder, localized reactions, such as tingling in the mouth. To remind you a bit about my daughter's history, she has never directly eaten, or reacted to, a peanut in her life, but her peanut blood test values have always been high (75.5@18 mos. and 95.6@33 mos.) With the threshold for a true peanut allergy being 14 with 100% predictability, we, of course, kept peanuts out of her diet and avoided any and all traces of peanuts. She also tested highly positive for almonds and moderately positive for walnuts and due to the cross-contamination dangers of other nuts, we avoid all tree nuts, as well. Despite this evidence, I still wanted to get the uKnow peanut component testing done. I would sometimes encounter people who would ask, "how was your daughter's peanut allergy diagnosed?" When I would reply, "blood test," I would get the "Oh..." and feel like perhaps they didn't quite believe that it was real, since so many people still hold on to the belief that blood tests are only "50%" accurate. (If you feel that way, please go see this other post.) I must admit that the thought had cross my mind...could it be a false-positive? What if I was doing all of this work to keep her away from something that wasn't really a danger to her? I had seen what milk could do to her, but I had never seen the effect of peanuts on her. I certainly don't want peanuts to "prove themselves" to me, of course. However, I knew I needed to get more answers. (1) Are you "sensitized" (what we refer to as allergic) to peanuts? (2) Are you sensitized to the components responsible for "systemic" (what we refer to as anaphylactic) reactions? (3) Do you have cross-reactive sensitization to birch or other plants, which would give you the milder symptoms? We had a playgroup holiday party the day before the appointment to get the results and someone brought peanut butter crackers as one of the potluck snacks. I promptly asked that they be removed and it was then that I had a fleeting, hopeful thought that I might get news the next day that perhaps she would only show the component for the cross-reactive component and I wouldn't have to be on such high alert for all traces of peanut, but I quickly put that thought aside. 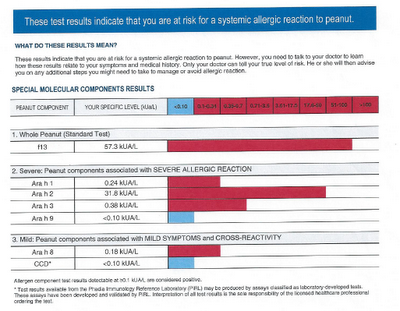 "These test results indicate that you are at risk for a systemic allergic reaction to peanut." I asked the allergist about the difference in the "whole peanut" value from her last test, but she said that it just varies depending on the lab and that the change in number really doesn't matter, until the number dips down to 2 kU/L, for example, so it looks like this will be an issue for a while. So, we just continue doing what we've been doing, but now I feel like I have specific, molecular confirmation of my daughter's peanut allergy. Now, I don't have to wonder "is she or isn't she?" Edited to add: Here is a link to the Peanut Component Panel Interpretive Guide. These components are now available directly through the Phadia ImmunoCAP catalog, and do not need to be paid for out of pocket, as a separate test.